This instrument analyzes the structure of molecules by evaluating the electromagnetic radiation emitted by certain atomic nuclei when they are subjected to their electromagnetic resonance frequency in a strong magnetic field. Our Brüker Avance DRX 500 MHz NMR spectrometer is equipped with a Z-axis gradient unit and a variable temperature controller, and can be operated with either a 5mm broad-band multinuclear (PABBO) probe or a 5mm 1H/13C/15N (TXI) inverse probe. 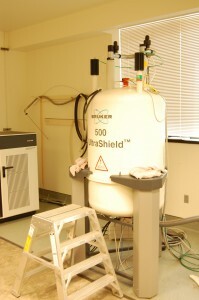 This instrument allows chemical scientists at Williams to determine the structures of molecules from a wide variety of projects, ranging from natural product total synthesis, polymer synthesis, materials science and catalyst development research projects, natural product isolation studies, and structure determination of small peptides.